LAFAYETTE, LA, October 22, 2015 – A response filed to City of Crowley’s Motion for Summary Judgment in the matter of Clay Lejeune, et al vs. K.P. Gibson, provides details into the release of two videos which surfaced regarding the alleged home invasion and arrest of Crowley Attorney Clay Lejeune and his wife Mitzi Lejeune. The memorandum indicates that Defendant Officer Primeaux also admitted that his intention for posting the video on YouTube was to protect the officers and incriminate Clay and Mitzi Lejeune because he did not believe that District Judges would protect him. Q: All right. What was your purpose in putting it on the internet so everyone could see it? A: I wanted it – I wanted the public to know what happened. That would protect us as officers. The officers involved. Because I felt like the case was going to get dropped. Which it – I mean, it was. So I just wanted everyone else to know what occurred. Q: Let me ask you this, I don’t mean this sarcastically, why do you believe that it’s your job, Officer Primeaux to go let the public know about all of this as opposed to letting the court officials or the judges rule on what’s appropriate evidence for a public trial? Why do you believe that’s your role? Q: I mean, do you have any reason to believe that a local judge here in Crowley wouldn’t apply the law fairly to determine what evidence the public gets to see at the Lejeunes’ trial? Q: I mean, if you do, let me know. A: I honestly do not believe that the judge – the local judges would apply a fair case for them. Q: Okay. And who are the local judges that you don’t think would be fair? A: The – Judge Trahan, the district judge. Because he is the one that issued us – that ordered us to release him on a citation for felony charges. 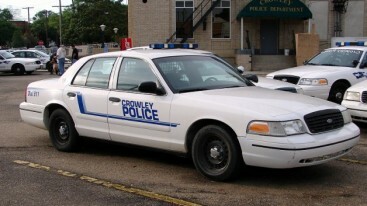 The memorandum goes on to highlight that Officer Primeaux left employment with the Crowley Police Department and later returned despite allegations that Chief K.P. Gibson knew he had posted video of the incident on YouTube. Q: Do you believe that the officers – and I’m going to use May of 2014, should be able to take the original body camera evidence and video record them and distribute them on the internet? A: Do I think they should be able to? A: No, sir. That’s not something I would want done. Q: In fact, not only did you not discipline him, you rehired him, didn’t you? A: Yes, sir. I did. A: Seven people in the hole. Can’t get recruits, officer. We worked on moving forward and approving what we do from that aspect. Q: Once he confessed to this did you do an investigation into this? A: No. No further than that, sir. Just our conversation.